My favorite meal ever is my Mom's Rosemary Lemon Chicken with rice and peas! 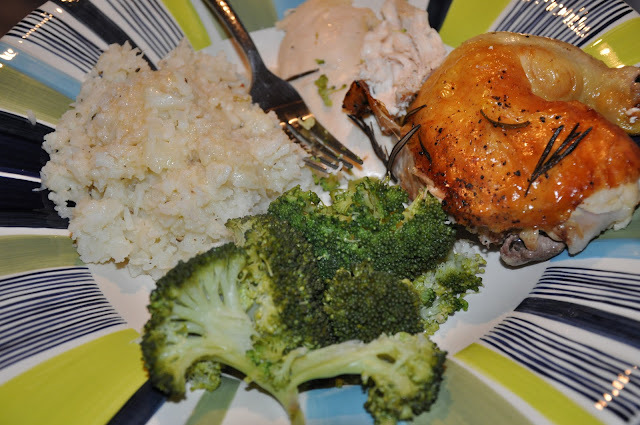 When I was younger, I would regularly request this meal and pretty much eat the ENTIRE chicken. Now that I am older and more refined, I make the chicken for myself pretty regularly and only eat about three quarters of it. I am now passing this recipe on to all of you! Preheat your oven to 425 degrees Fahrenheit. Rinse your chicken and remove the insides. 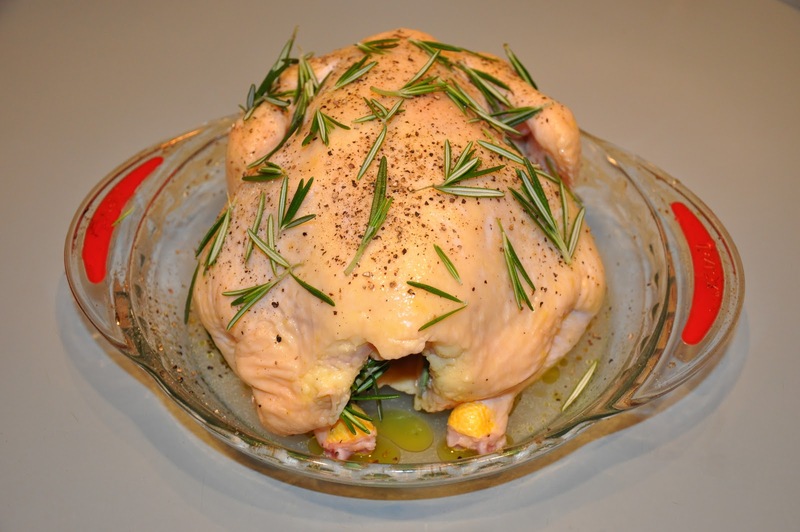 Rub your chicken down and all around with a generous amount of olive oil (about 3 tbsp). 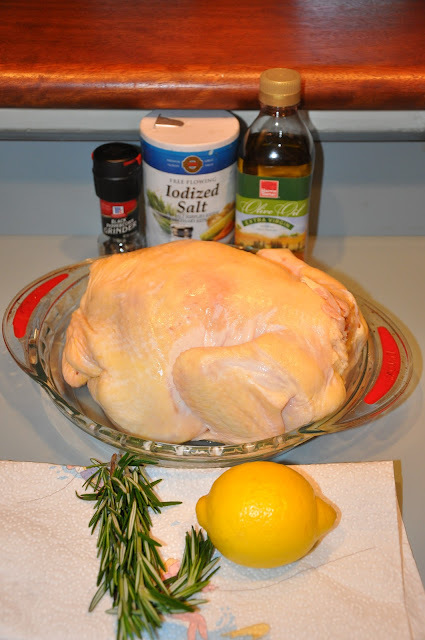 Squeeze lemon over chicken and then generously salt and pepper him (or her). 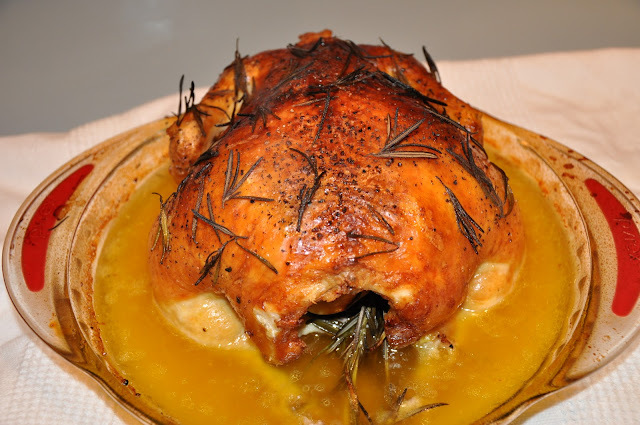 Sprinkle with rosemary, and stuff lemon peels and left over rosemary inside the chicken. 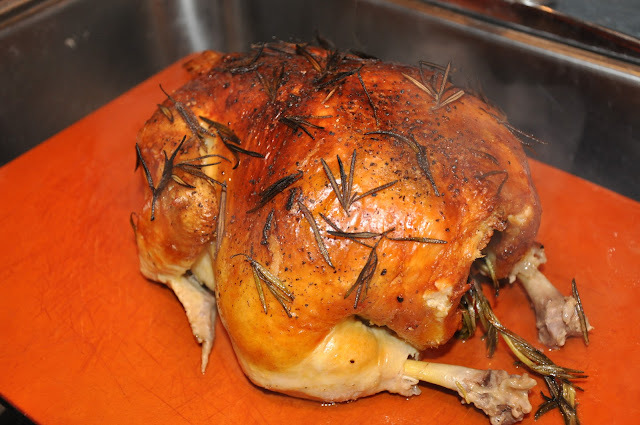 Place the chicken in a roasting pan. **Note** I do not have roasting pan (and do not have room for one)...so I always just bake mine in a pie dish...this works fine, but later on he is sitting in his own juices. So for a healthier bird and roasting pan with a rack would be preferred. Place chicken in oven and set timer for 20 minutes. While your chicken is baking whip up a little snack: healthy ranch dip. 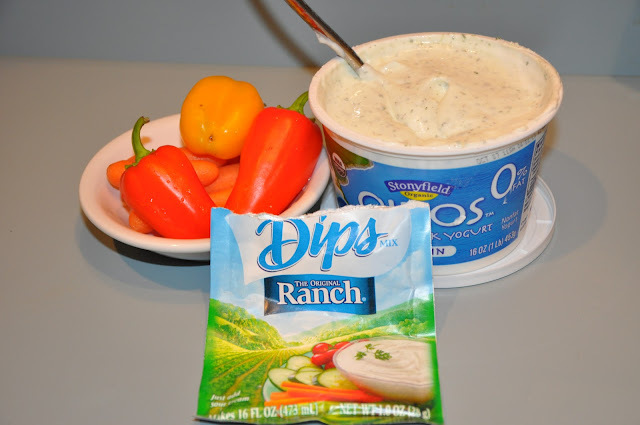 Just place a ranch packet in a 16oz container of Greek Yogurt and mix together. Serve with veggies! Delicious! After 20 minutes at 425 turn the temperature of your oven down and bake at 400 degrees for another hour. Remove from pie dish (or baking rack) and let rest for about 10 minutes. **NOTE** I can never wait this long...so I usually end up with burnt fingers. Slice up and serve with some rice and broccoli. I also usually make a gravy with the drippings and a bit of flour. Delicious!!! Definitely try this recipe...you won't regret it!